This rugged belt clip phone case is the perfect multi-purpose companion for your phone, 2 single stack magazines, or wallet. A perfect fit for smaller smartphones like iPhone 5, 6, 7, 8, Samsung Galaxy S6, S7, S8 and similar sized phones. The Slip-proof black metal oxide belt clip is stitched to back of case for added security and a firm grip on your belt. For holding your credit cards or loose items, a sturdy elastic pocket provides a firm grip to secure items within. Made in the USA from vegetable tanned leather that will not corrode metal objects like cheap foreign leather can. Ultra durable stitching throughout with double stitched seams on stress points give the holster added strength and durability. 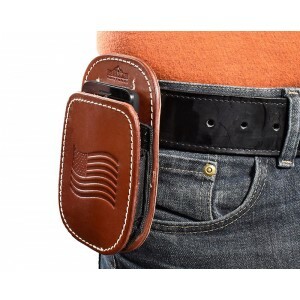 The leather phone case is also perfect for ultra-compact handguns with room to spare for magazines or as a sleek and fashionable leather smart phone or cell phone belt clip case. Backed by our 1 year warranty for manufacturer defects. Available in black or mahogany. Works as described , Looks good, Have used with Phone and have used with Ruger LCP. You can not put both in at same time. The price reasonable, the product is well made. My smartphone was continually coming loose from its plastic belt clip due to snagging on things while working outside. The Blue Stone 3-in-1 holster is more comfortable tVic19o wear and to gain access to, and my smartphone stays in place. Holds my smartphone secure. I is comfortable on hip.Holds below the belt line. This is the fifth holster I have purchased for my Apple phone, so far this seems like it will be the last. It works very well, I use t for my phone only my 1911 will not fit. Good quality leather. It is really a multi use holster. I use it for my cell phone because it keeps it secure out on the water and in the woods. I didn't trust my clip on holster with a 700 dollar phone. It serves me well and I recommend it. Fits tight around the phone.